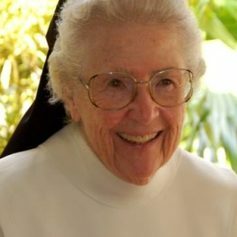 This year, the St. Hugh Parish Sr. Kathleen Donnelly Scholarship Committee will select one or more award recipients who will receive or share up to $10,000 of scholarship funding, covering up to 95% of annual tuition, books, and school related fees for one school year. The exact amount awarded will be determined by the Scholarship Committee. Applicant must be pre-school or grade school student. Applicant must be a member of St. Hugh Parish with a minimum of two years of continual registration and participation as a member of the church. Applicant and applicant’s family must be in good standing with the practice of Catholicism/this is a criteria that will be determined by the pastor of St. Hugh and may include but not limited to regular church attendance and/or participation in some sort of ministry or parish activity. Applicant must exhibit academic promise and achieve a minimum of a B average or proficient status which must be maintained throughout the academic year for funding to be provided. Applicant must demonstrate economic need/the financial situation of the applicant’s family, as a whole will be considered when determining economic need. Copy of their most recent pre-school or grade school transcript with cumulative grade point average. Copy of the applicant family’s income tax return for the most recent three years is submitted through FACTS Management ( Factsmgt.com (2018-19 Grant & Aid). Narrative description of applicant’s family involvement in St. Hugh Church and School, including the practice of Catholicism. Applicant must agree to a personal interview with the scholarship committee upon completion of application. Scholarship funds are to be used for tuition, books, and school related fees only and will be issued directly to St. Hugh School. Applicant must provide evidence of enrollment or registration in St. Hugh Parish and, if applicable, St. Hugh School. Scholarship may be reduced, suspended or terminated without cause for any reason, including without limitation, the failure or the applicant to maintian the minimum grades that were required for the initial award.